Outpouring of love continues for deputy gunned down in northwest Harris County. HOUSTON (KTRK) -- A memorial to the memory of Deputy Darren Goforth is expanding its footprint on what was a crime scene last Friday night, the place where he was ambushed and killed. There are flowers, poems, posters, and chalk messages on the pavement left by school children. And somewhere in all that, volunteers who've been staffing the site found something priceless -- a Purple Heart medal, given to service members who've been wounded or killed. Someone thought Darren Goforth deserved one. 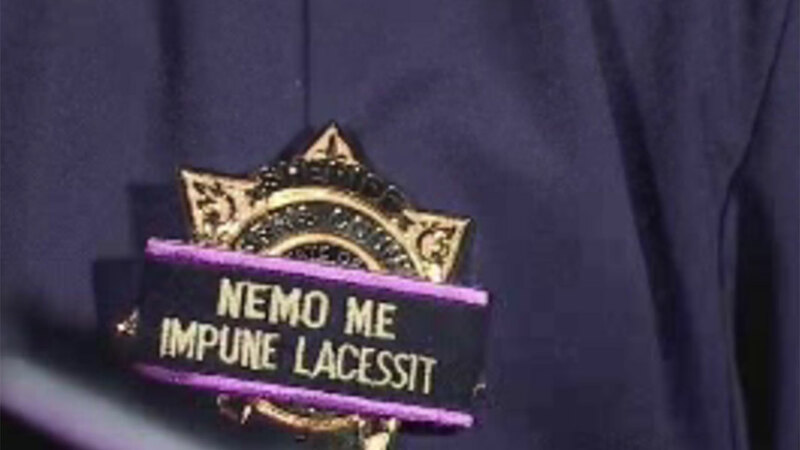 The medal is attached to a striped ribbon and pin. The ribbon is slightly discolored. The enameled medal is in perfect condition, save for the back, in which all information that might have identified the person who was awarded the honor. Volunteers believe whoever it was, wanted to remain anonymous. Christine Bossi, one of the volunteers said, "It means someone cares and loves that family that much and is trying to honor his death through that." The monetary donations for the Goforth family have surpassed what anyone expected to be collected on street corners and at the Chevron gas station. Late Tuesday, we were told $100,000 had been collected, dropped in small plastic pails, and a donation basket beside the gas pump where the deputy lost his life. A GoFundMe account has raised nearly twice that in only three days, set up by another Harris County Deputy. Bossi hasn't set a goal for the fundraising which will go to widow Kathleen Goforth and the couple's two young children. "She lost her husband," she said. "And she has two children to put through college one day." She hopes to find corporate sponsors to match the donations.